First off, update: flights to Lukla cancelled today. So have to reappear at the airport at the crack of dawn tomorrow for take (off? Let’s hope so) two. (Google Lukla Airport and YouTube some landings if you have a spare sec to see what I’ve got to look forward to facing – bit of a cliffhanger for ya). The five of us expeditioners returned to Thamel and decided to push the boat out and stay at a flasher facility. 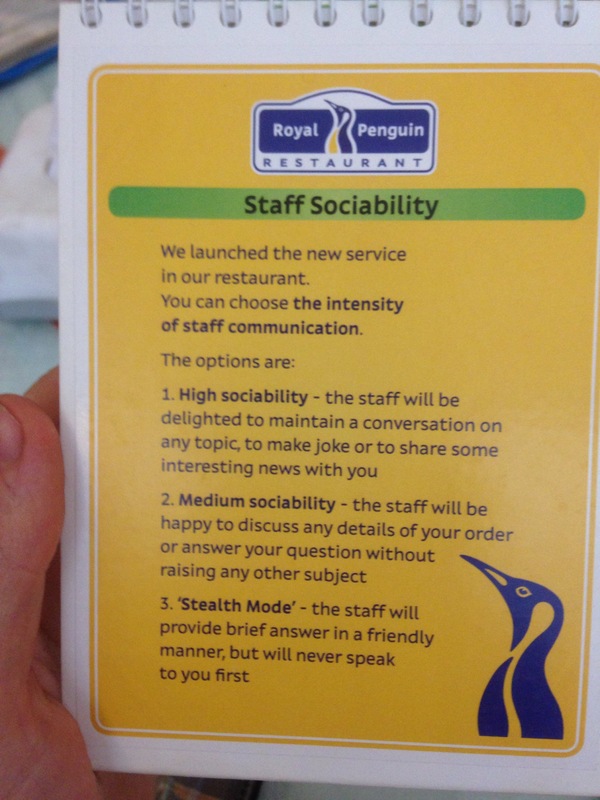 So the Royal Penguin Hotel! 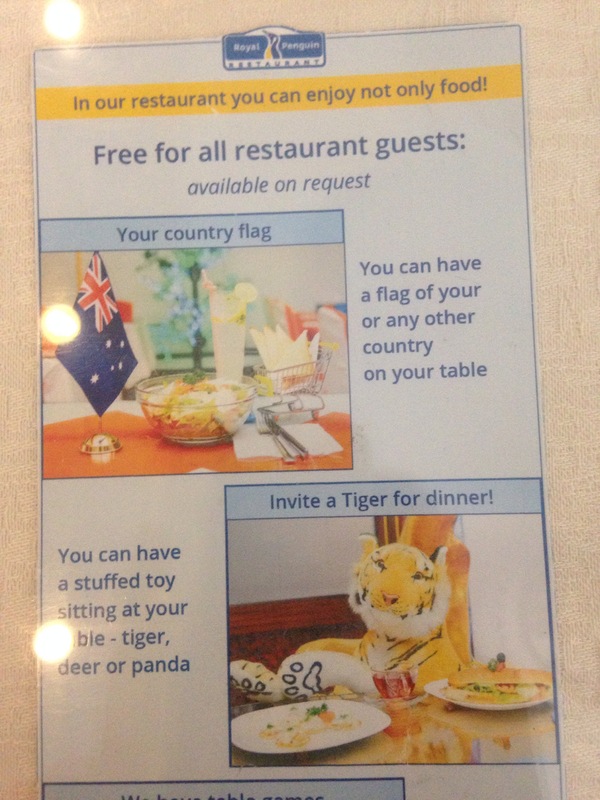 A quirky establishment complete with tiger toys on the beds and a sauna to steam in. Usually a good $250USD for a king size deluxe room a night, the earthquake has obviously hit them and their patronage pretty hard; agoda and bookings.com has them specialled for $40USD for a downright decent double. We sat and mowed back a good lunch along with Ram (trekking guide). We had lots of laughs along with some sad conversation about the earthquake (Ram got tears in his eyes as he told us his tale of when it hit). Then we were all absolutely rooted and hitting brick walls so we retired to our rooms (and reclining tigers) for rests all round. Except I didn’t. 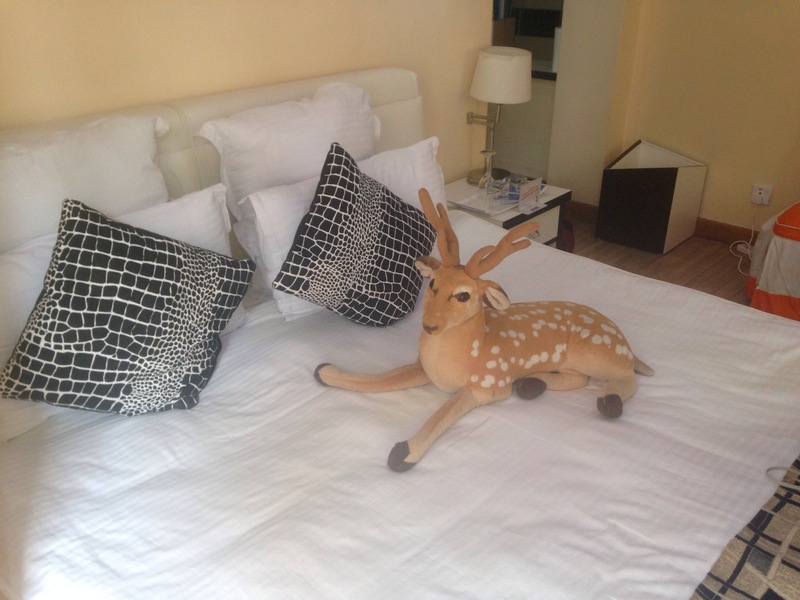 The tiredness overcoming me in the restaurant was dispelled by mirth when I reached my room and found a deer perched on my pillows. It was so delightful! Suddenly I felt a surge of energy and on hearing the hotel had a gym, I decided to thrash the treadmill. I met Josh in the hallway and we decided to rid ourselves of toxins with a sauna (see how I’m slowly – slowly – starting to be spontaneous? Small steps!). We sat in the steam room for two fifteen minute blocks, yarning about partying, religion and war. He is so intelligent and clued up; I thoroughly enjoy listening to his perceptions and ponderings. After a twenty minute machine run and forty-odd minutes of yoga (time honestly just catapults by, I get so lost in asanas) I had a shower. Once again, the RPH (Royal Penguin Hotel) did themselves extremely proud; a heavy flannelette dressing gown was there to robe me on vacating my wash room, and there was a razor to shave my porcupine prickled legs. I felt as fresh as a poppy (doesn’t have to always be “daisy”), incredibly refreshed and rejuvenated. The disappointment at the cancelled charter modified to become ever-growing gratitude. 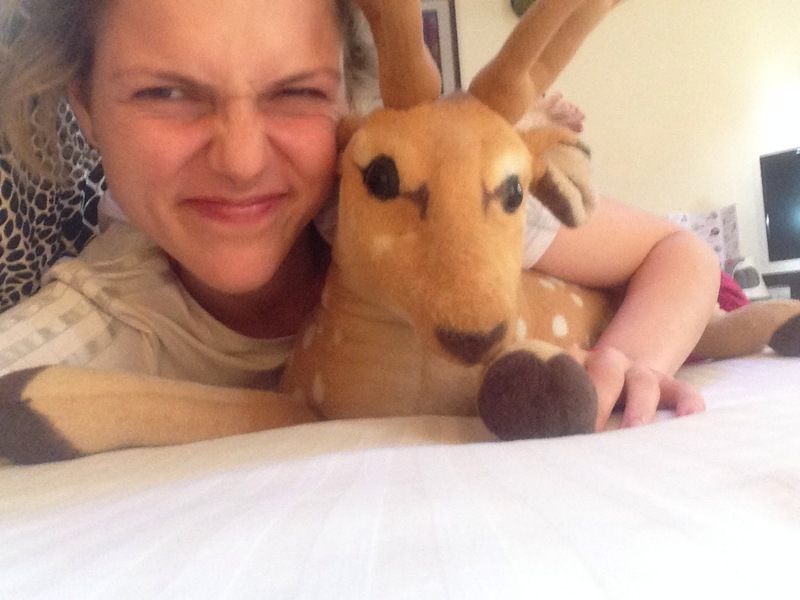 An early night in my comfy bed with my deer is on the cards, after a bowl of stir fried veges to settle the stomach. I’m so happy. I’m so at peace. I’m surrounded by people I very much enjoy and find fun. Hilarious!! 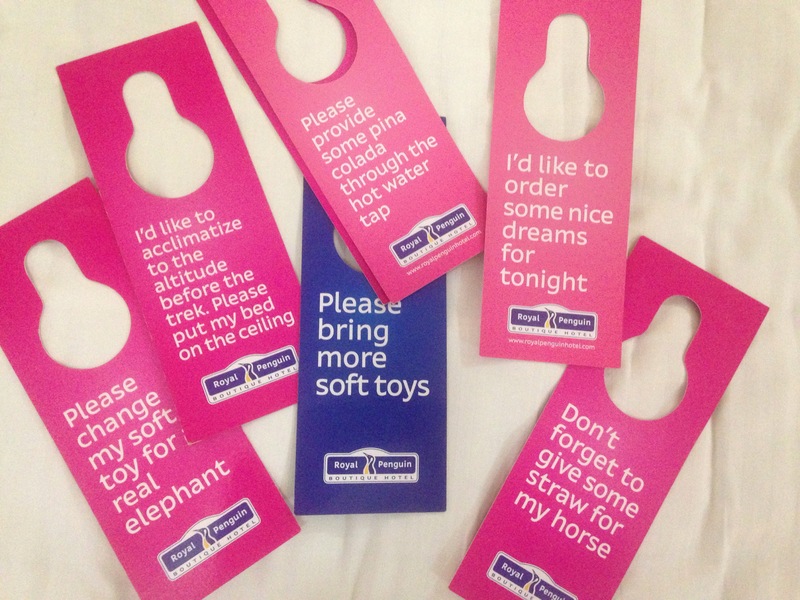 Those door signs are gorgeous!! !